It’s a cold Tuesday and (as Coen will establish later) half the attendees have to work the next day, but that doesn’t stop the EPICA-fans from coming to Cologne’s Essigfabrik and stand in line pretty early in the evening to see the Dutch Symphonic Metal icons. MYRATH get the party started! The evening starts with Tunisian Metallers MYRATH, who deliver a strong short show and heat up the audience with their warm melodies. A belly dancer’s performance spices up some of the band’s songs and gives the photographers some gorgeous scenes to capture. ‘Believer’ is the hit that stays in my head long after the band has gone off stage and gone to the merch booth to sign some albums and take pictures with the concert-goers. VUUR live is pure fire – on and off the stage! We don’t have to wait too long until VUUR steps onto the stage of the Essigfabrik and rocks! As usual, frontwoman Anneke van Giersbergen is a fireball – this Dutch power lady is always full of energy and warm smiles for the audience. The amazing songs of the band’s debut album “In This Moment We Are Free – Cities” sound great live and the crowd finally gets more active, clapping at Anneke‘s command. My personal highlights are VUUR‘s ‘My Champion – Berlin’ and ‘Days Go By – London’, but only because I’ve listened to them the most and can hum along. After announcing their headlining gigs next year VUUR end their short set with THE GATHERING-classic ‘Strange Machines’ – a song I’ll never get tired of hearing. This is certainly only an appetizer to get everybody fired up for the band’s upcoming live dates. And if you’re wondering how to pronounce the name of the band correctly, give our Metal & High Heels Podcast episode featuring Anneke a listen. Not long after the gig ended, there was a long line of people waiting to talk to Anneke, who was nice and warm as always and patiently signed everything people put in front of her. This is the peak of EPICA’s live performances. The first time I saw EPICA live was back in 2008 when they were touring with AMBERIAN DAWN – and took themselves way more seriously. Over the years I have seen them perform several times, in bigger and bigger venues and this time was by far the best EPICA-gig I have witnessed. Needless to say that each member of the band masters their instrument and rocks the stage effortlessly, it seems. Nowadays EPICA obviously have so much fun on stage, that the whole show seems to incorporate comedy elements that ranged from singer Simone asking the crowd to give her “the Pommesgabel” – the German word for “French fries-fork” and figuratively the sign of the horns – to keyboardist Coen jumping into the crowd mid-song and guitarist Isaac telling the audience to scream “geil” (German for “cool” but also for “horny”) to introduce “Sancta Terra”. Another highlight of EPICA‘s show was the setlist: I didn’t expect them to perform ‘Unleashed’ and ‘Unchain Utopia’, long-time favorites of mine. 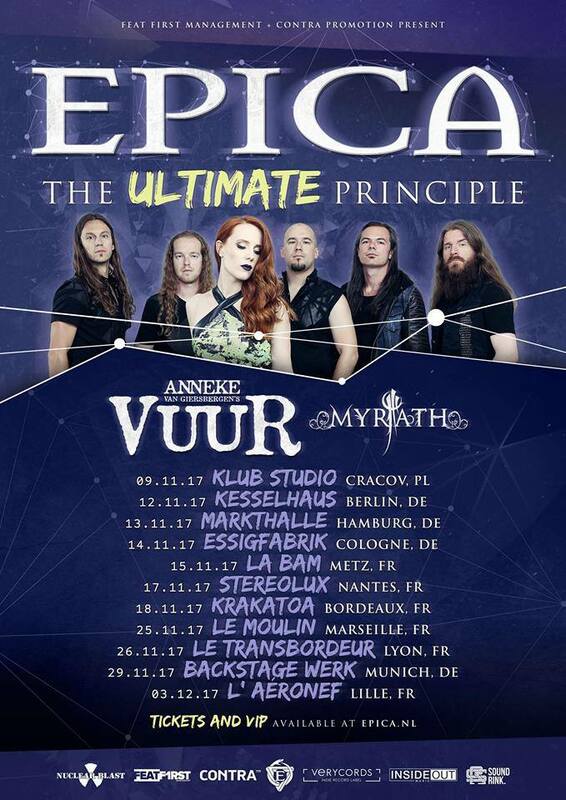 It’s also amazing to see ‘The Obsessive Devotion’ live again as well as the title track to EPICA‘s latest album “The Holographic Principle”. The Essigfabrik really heated up during ‘Beyond The Matrix’, where Simone got the crowd to jump up and down with the band. Sweaty but happy faces left the venue shortly after, as did I. And even though I think this is the peak of EPICA‘s live performance so far, I have no doubt that they’ll keep getting better and better and can’t wait to see them play live again. UPDATE Friday, November 17th, 2017: EPICA has published an after movie of the concert in Cologne in great quality and with one of my favorite choruses on their album.